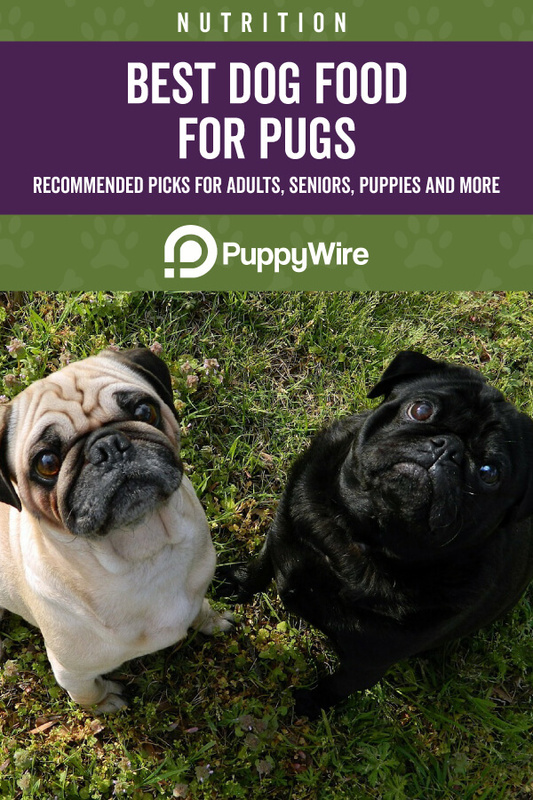 Your wrinkly-faced pug is an affectionate, loving, and spunky bundle of energy that has special dietary needs to help ensure that they stay healthy throughout their lives. You have to balance giving them the nutrition they need with catering to their sensitive digestive systems. 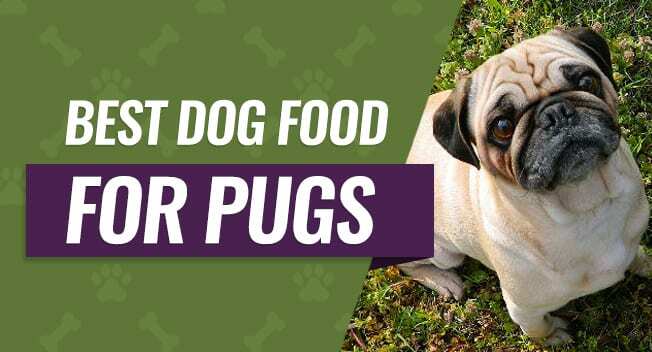 We understand that this can make finding the best dog food for pugs difficult, and this is why we've rounded up the top six dog food choices that you may want to consider feeding your furry friend. Our buyer's guide will outline essential considerations to keep in mind when you're dog food shopping, and this can help to ensure you get the best food possible to keep your dog healthy and happy. Your pug's optimal weight range is between 14 and 18 pounds, and it's very easy for these dogs to gain weight. Since this dog breed is so compact and prone to breathing issues, even one extra pound can cause a lot of complications, and it's harder to take the weight off than it is to put it on. This is why balancing your pug's daily caloric intake along with any sensitivities is so important, and portion control is also important. Your pug most likely won't stop eating if they still have food in their bowl, so it's a good idea to start them on a quality puppy food and change the food as your dog grows. On average, your pug will need just over 700 calories per day if it weighs 18 pounds, but they'll need less if they're spayed or neutered. Additionally, older dogs and dogs that aren't as active will need fewer calories to maintain a healthy weight. Since this is a more active breed, it is recommended that they have a slightly higher protein content in their food, and it should ideally range from 22 percent protein for growing puppies and 18 percent protein for adult pugs. This will help to give them energy and develop their muscles as they grow. Fats are another important component in your pug's food, and you want to find a dog food that has at least eight percent fat content for puppy food and five percent fat for adult pugs. Look for dog food with Omega-3 and Omega-6 fatty acids because these types of fat can help keep or get your dog's coat and skin to a healthy state. There are several breed issues that can arise from feeding your pet an unbalanced diet, and they can have a lasting impact on your pug's quality of life. Allergies - Unfortunately, pugs are prone to developing allergies like irritated skin and dandruff, and a lot of these allergies can have genetic factors. If your dog has allergies, switching their food out to a grain-free formula or feeding them a grain-free formula may help calm down any irritation and cut down on dandruff. Breathing Problems - Pugs may have cute wrinkly little faces, but this wider head with a shorter snout can lead to breathing problems. If your pug puts on weight due to overfeeding or feeding them the incorrect type of dog food, it can add pressure on their respiratory systems and exacerbate their breathing problems. Hip Dysplasia - Pugs come in second for the highest percentage of hip dysplasia out of any other dog breeds, and carrying around additional weight can increase your dog's risk. Feeding your pug a balanced and nutritious diet can help to reduce the risk of developing this condition. As we mentioned earlier, protein is extremely important in your pug's food, and this is especially true when they're puppies and still growing. You want a protein source listed as the first few ingredients in your dog's food, and it should be a whole protein source instead of by-product meal. A whole protein source means that it comes listed on the ingredient list as beef, chicken, lamb, or fish. You may also see a meat meal listed on your dog food label because this refers to whole meats with their water content removed, and they're usually a higher protein source than whole meats. Fats are important for your dog's coat and skin as well as their energy levels, and this is why it's important to find a dog food that offers higher levels of Omega-3 and Omega-6 fatty acids. Ingredients like chicken fat or fish oil are excellent sources of these fatty acids. These healthy fats also play key roles in ensuring that your pug develops normally, reproductive health, good immune function, coat health, and skin health. Your dog will need good levels of fats throughout their lives to stay happy and healthy. You want to avoid filler in your dog's food and look for clearly labeled vegetables and fruits like peas, carrots, cranberries, and sweet potato. If your dog food has these listed, it's usually healthier because there isn't a lot of by-products to fill in the gaps left by the fats or protein. 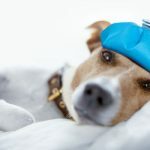 A lot of dog food likes to have by-product meal or filler ingredients that aren't healthy for your dog to eat, or that can cause inflammation or skin problems. A lot of grain, wheat, soy, corn, dyes, gluten, and meat by-products are good examples of ingredients that you don't want to see listed in your dog's food. Your feeding schedule for your dog food should stay the same no matter what your dog's age, activity level, and whether or not you had them spayed or neutered. Keeping your dog on the following feeding schedule can help ensure that they're full throughout the day. Your pug will eat more as a puppy because they need more nutrients to grow, but you should switch them to adult dog food after a year because puppy food comes packed full of calories and this can lead to rapid weight gain, even if your pug is on the active side. The first ingredient in this adult dog food is deboned chicken, and this formula contains a healthy amount of fruit, garden veggies, and whole grains. Your dog will also enjoy Blue LifeSource Bits, and these Bits contain a healthy blend of antioxidants, minerals, and vitamins to support your dog's health. This food contains no chicken by-product meal, corn, wheat, soy, preservatives, or artificial flavors in this food, and this makes it a healthier choice for your dog. 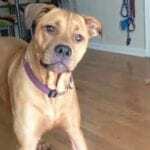 You also get the choice of three different sizes, and this is helpful for smaller dogs and for people who want to buy larger sizes, so they don't have to purchase the food as much. Pug parents who chose this dog food liked that real meat is listed as the first ingredient on the package, and they also liked that it contains Blue LifeSource Bits for an additional nutrient boost. They didn't like that this dog food is slightly more expensive than other brands or that the kibble pieces are a little bigger. This small breed senior dog food contains a high quality protein source from turkey, blueberries for antioxidants, spinach for antioxidants, and flax seed to support a healthy coat and skin. Your pug will enjoy smaller kibble size that is easier for them to pick up and eat as well as all natural ingredients that support your dog both inside and out. This dog food is made in the USA, and it is held to very high-quality standards, and it doesn't contain soy, corn, wheat, meat by-products, preservatives, artificial colors, or artificial flavors. There is also glucosamine and chondroitin that promotes healthy hips and joints, and this is important with senior dogs who have hip problems like pugs. 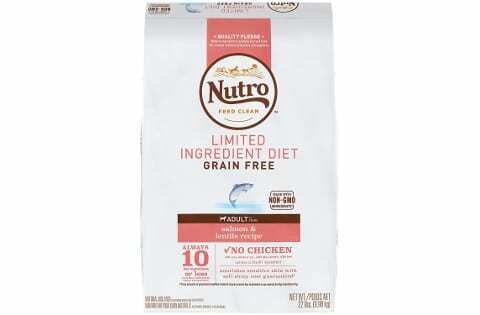 People who purchased this dog food liked that it has several ingredients that promote healthy joints, and they also liked that it has an all-natural formula that is free of dyes and artificial flavors. They didn't like that this dog food can leave a greasy residue or that it can upset very sensitive stomachs. This puppy food comes in seven different sizes and with three different formulas that lets you to customize and change your order to meet your dog's needs. 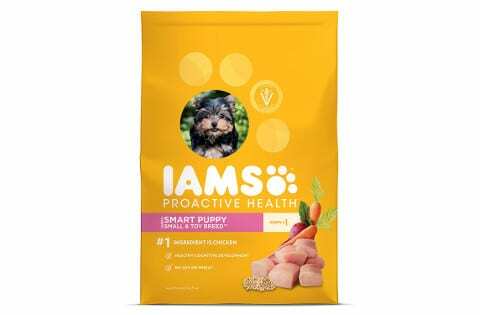 Real meat is listed as the first ingredient on the bag, and this puppy food is formulated with 22 other key nutrients that are found in the mother dog's milk to help ensure healthy and happy growth. This dog food has no soy or wheat for a better formula for sensitive stomachs, and it contains ingredients that promote healthy cognition along with Omega-3 fatty acids for a healthy and dandruff-free skin and coat. 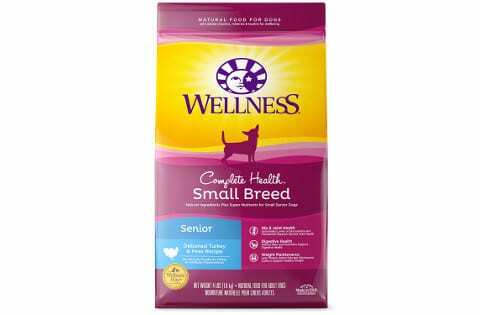 You'll find a variety of vegetables, fruits, minerals, and whole grains in this puppy food. People who tried giving this puppy food to their pug liked that it contains higher levels of meat-based protein, very little filler, and fatty acids that promote brain health. They didn't like that it had a slightly stronger smell when they first opened the bag, and they also didn't like that it's more expensive to buy online than in the store. Picky pugs may love this dry dog food with real shredded meat pieces because it comes in chicken or lamb as the protein with brown rice that is easy on their digestive systems. You also get the choice of several different sizes, and this makes it easy to try a few flavors without breaking your budget. This shredded formula comes with live probiotics to support your pug's digestive health, and it comes packed full of fatty acids, calcium, phosphorous, prebiotic fiber, vitamin A, and other minerals and vitamins to support a shiny coat as well as a healthy immune system. Pug owners who bought this picky eater dog food liked that it contains real shredded meat pieces as well as smaller kibble and live probiotics to support digestive health. 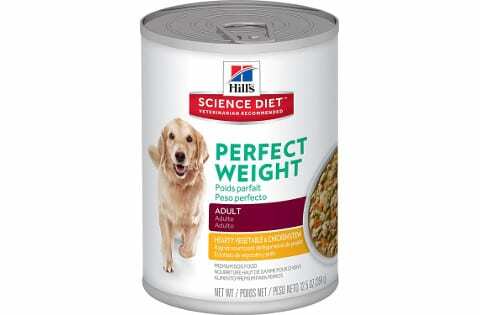 They didn't like that this dog food can take up to a week or more to fully transition to or that their dogs could pick out the meat and leave the kibble. This dog food comes in five different styles, three different flavors, and six different sizes so you can purchase the correct amount of product for your dog. 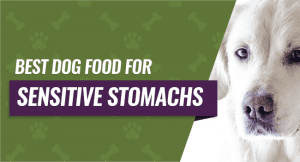 This food is recommended for dogs that are overweight, less active, or older because it helps to remove excess weight and it also helps your dog maintain a healthy weight. This formula contains prebiotic fibers from beetroots, and these fibers help to promote great nutrient absorption along with healthy digestion each time your dog eats it. There is no artificial preservatives or flavors with this dog food, and this makes it a healthier choice to help your dog lose weight. People who bought this soft dog food liked that it contained prebiotic fibers from beetroots that helped their dogs absorb as many nutrients as possible from their food. They didn't like that this food can have a stronger smell when you first open the can and that it gets hard if you leave it set out. This limited ingredient dog food comes in six different sizes and four different flavors including lamb, seafood, duck, and venison that allows you to tailor your selection to your dog's taste. This specialty food contains 10 key ingredients or less along with important vitamins, minerals, nutrients, and fats so there is less for your dog's stomach to disagree with. Real meat is the first ingredient with this formula, and it also contains high-quality ingredients that exclude soy, dairy, corn, wheat, and grains because these are common triggers for digestive upset. It's designed to work on your dog's insides as well as on their coat and skin to leave them shiny and healthy. Pet parents who gave this food to their pugs liked that it comes with 10 key ingredients or less, and they also liked that it contains no soy, dairy proteins, corn, or wheat. They didn't like that this food was one of the more expensive options available, and they also didn't like that the kibble is extremely small. Our pick for the best dog food choice for pugs is Blue Buffalo Life Protection Formula Natural Adult Dry Dog. We liked that this dog food contains fruit, vegetables, whole grains, and a real meat source as the first ingredient. We also liked that it comes with Blue LifeSource Bits for a boost of antioxidants, minerals, and vitamins to keep your pug happy and healthy.